HDFC is one of the largest private banks in India and the credit cards from the bank are worth its great deals. The bank has developed many strategies to bring out best deals and provide best money solution to the users. Credit cards have greatly helped in making our expenses easy and help purchase expensive things without putting pressure in our wallet. The HDFC credit cards have number of benefits that helps in saving more money and helps in efficient money handling. It is very simple to apply for HDFC credit cards and the application process is very easy. With the technological advancement an applicant can apply for the credit card online and also keep a track on the status of the credit card. In the home-page, click on the product tab followed by click on credit cards tab. After clicking on the credit card tab, it will open a page with "Track your Credit Card Application Status", click on it. 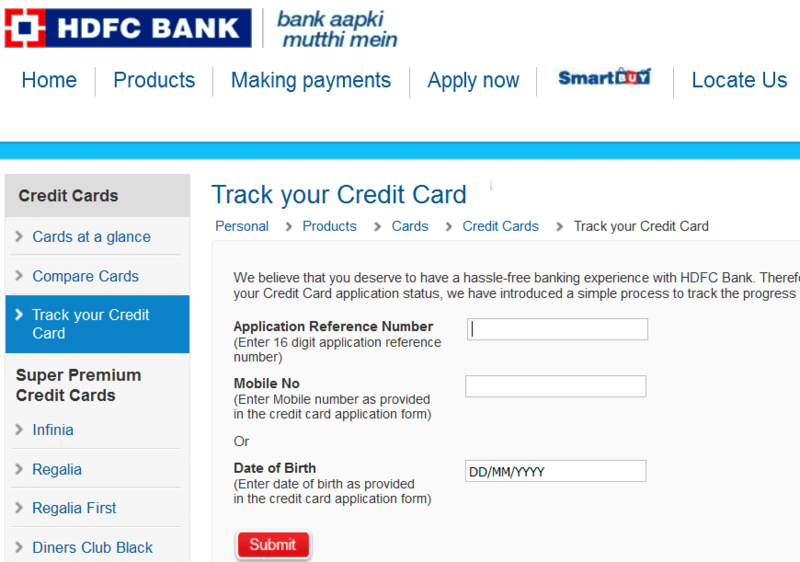 Here is direct link http://www.hdfcbank.com/personal/credit_card/cc_track. This will redirect you to a different page and will open up a screen with track your credit card. The user needs to fill up "application number" and "mobile number" or "date of birth" and click on submit. 4. After clicking on submit, it will give the details of the credit card and track the information and credit card status. I have submitted all the required documents for credit card to HDFC credit card agent, However, I didn't get any updates from the HDFC bank. Its a humble request on behalf of everyone try to update the status of the application via SMS or Mail or else please don't give a fake commitment to customers. The customers will choose any other banks which provide a good service. My application reference no18041612850120N1.. Verification completed 4 days ago but not showing any status and not received the card. Sir, my name is Arun Kumar Chattopadhyay. Credit card Application No 17122814386780QT. I have received message on 06 Feb 20118 that "We have completed processing your HDFC Bank Credit App ....... . For details pls visit ...... after 2 days". But no information/reply has been received till date. Please confirm the present status of Credit Card Application. My Mobile No is 09958472070. Its saying no record is found.. Please fill correct details to know credit card status. Hi My Name is SANTOSH CHAUHAN my Credit Card Application no is 17112914976860QT verification is complete ,But card not received please tell me what’s problem..i will submitted all type of documents. HI,My Name is birendra kumar my Credit Card Application no is 17101615238860PE ,But card not received please tell me what’s problem..i will submitted all type of documents. sir i have apply credit card my reference no 17091216458970N5 when i check status online it's show no record found.please confirm me my credit card apply or not ???? My hdfc bank cc is returned to the origin address,now how can i get my hdfc bank cc back. Hi My Name is Deep Chand Pandey my Credit Card Application no is 1708282095384001 ,verification is complete, But card not received please tell me.i will submitted all type of documents. I am sanjoy mitra my application no is 170825167858550E1 I have get a message your verification is complete.but not yet my card please conform me . Especially the guy called Ashish Pandey in the credit card department. He's a fraud, dog.. taken all my documents and no reply more over he's calling me from his private number n harassing me. And the bloody customer care doesn't even get connected..
Hi My Name is Chandan kumar singh my Credit Card Application no is 17081415610400O2 ,But card not received please tell me what's problem..i will submitted all type of documents. Sir I applied for cc with reference no:17071519616150,your reply is you are not reach the credentials of bank,I am a staff nurse working in well reputed hospital and getting salary 22000,per month,I didn't have any loans yet,I don't understand the problem,kindly help me to get it,thank you. Your customer support is very bad . no any response or support the HDFC site even call is not connected also. Sir, please conform my on line credit card application status .my on line e reference is 140077637.